"Award Winning DJ & Entertainment Company"
We are an award winning DJ entertainment. We run a DJ and entertainment service with lots to offer. 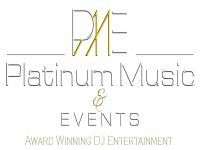 Platinum Music & Events offer a wide range of entertainment. Required by many venues, Platinum Music & Events has a current PLI policy with Mobile DJ Network in the amount of £10 million. Also required by many venues, Platinum Music & Events has not provided satisfactory evidence of having current PAT records available. A Method Statement outlining Platinum Music & Events&apos; Health & Safety procedure for setting up disco equipment has been provided. Why do people choose to book Platinum Music & Events? "Everything was fantastic. Tom is a great DJ. very experienced and modern"
"My 30th ran so smoothly! Thomas arrived before me set up with no fuss and catered for everyones needs! Truly was brilliant highly recommend :-)"
Platinum Music & Events also offers a range of additional party services not directly linked to musical entertainment. If you are contacting Platinum Music & Events about an event, it's always a good idea to include the DATE, LOCATION, EVENT TYPE, AGE GROUP and TIMINGS to speed things up!